Nearly every day we receive a call from someone surrendering their dog or from the over-crowded animal shelters in our service area. The person at the shelter informs our Rep that a Labrador Retriever is on death row and is facing the prospect of euthanasia very soon. GGLRR rescues and places ~250 Labs each year! Of course, our volunteers would like to save them all but can't save more without your help (see Why Rescue). And of couse, Adopt or Volunteer! 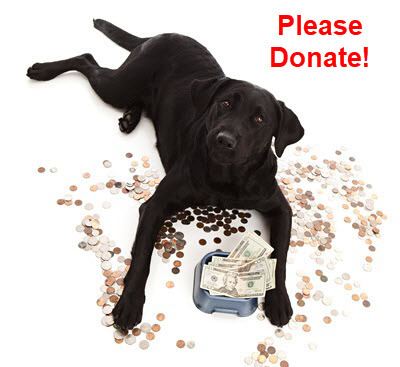 If you would like to help save a Labrador Retriever, please send a tax-deductible donation – every dollar helps. Your money will go to dog expenses such as shelter fees and medical care (shots, microchipping, spay/neuter and and other vet care often needed by abandoned dogs). We are an all-volunteer organization with no offices / overhead (volunteers work out of their homes) so your donations go directly to helping Labs in need. 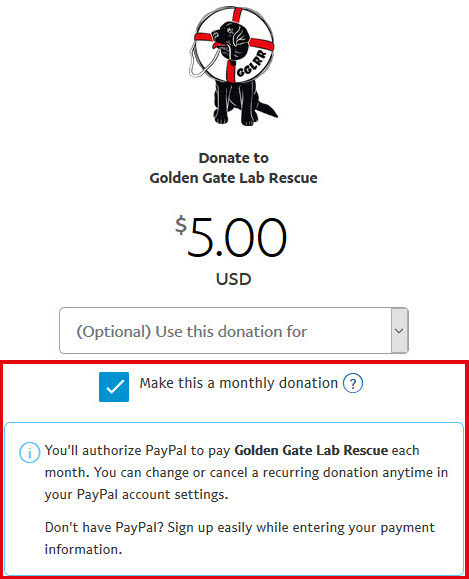 GGLRR receives discounted rates thanks to generous service providers to ensure our funds help as many Labs as possible. Online credit card donations are easy and secure using Paypal. They can be one-time gifts or recurring monthly donations (change/cancel anytime). Mail cash/check donations to GGLRR, 268 Bush Street #4322, San Francisco, CA 94104. Golden Gate Labrador Retriever Rescue, Inc. is classified as a 501(c)(3) charitable organization (nonprofit/tax-exempt) by the IRS. Our EIN tax ID is 68-0391542. Donations made to GGLRR are deductible from your personal tax returns to the extent allowed by law. You may specify your gift to go to a particular need like a specific Lab's special surgery, or by default, have it go to our general fund to help with all our rescued Labs' costs. We welcome one-time or monthly donations which can be changed/cancelled anytime. We also get donations from people wanting to designate the gift "in honor of" or "in memory of" a special dog or dog-loving person. GGLRR will send a professionally printed card with our logo if you specify where you would like the card to be sent. We also acknowledge all our generous patrons in our newsletters. 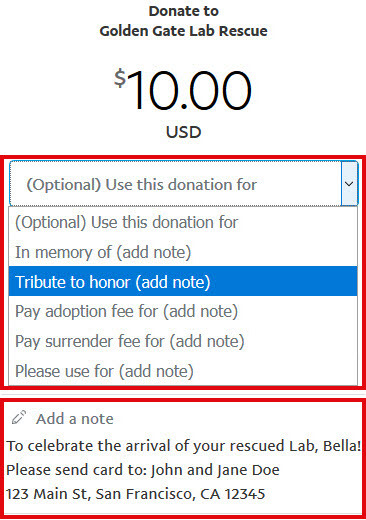 If donating online through PayPal, simply include any "Use this donation for" instructions and notes. If mailing your donation, just include a note with the designation information.